Due to exceptional quality, but extreme shortages, these unique packets have been created in the hopes of reaching as many helping hands as possible. Monarchs are counting on each of us to do our part in protecting their mystery and beauty. Only by working together can we insure that milkweeds and butterflies will always have a place in this world. Antelope Horn, named for the shape of the leaves, is a perennial that blooms in the spring and in some areas, again in the fall. 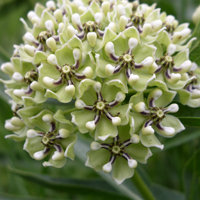 It's a member of the Milkweed family, and a special favorite of the Monarch and Queen butterflies. In the spring the first batch of Monarch caterpillars hatches and they eat their way through as much milkweed as they can! The poisonous milky sap is credited with making the Monarchs distasteful to birds. 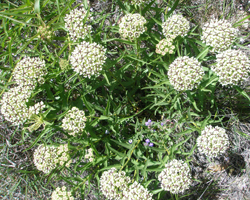 If you want to attract Monarch butterflies, this is your plant! Oh, and don't spray the caterpillars with pesticide! Antelope Horns are very hardy. They do best in sandy or gravelly soil, with fast drainage. 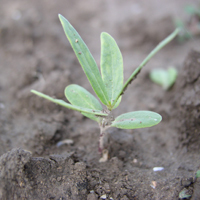 Plant the seeds where they are to grow, as the deep tap root develops very quickly, giving the plant it's toughness, and resistance to drought. Water only to establish, and during periods of long drought. Beginning in June, severely trim back one plant at a time, to provide fresh foliage for butterfly larvae all summer long.